Howdy, ya'll! It's time for another Teapot Tuesday, but on Wednesday. I kept trying to upload this to my blog last night, but it was havin' nuttin' to do with uploadin' my file. MariLynn is our hostess with the mostest today, and she gave us a beautiful cardinal teapot as our inspiration. We could use whatever we wanted from the teapot as our inspiration, which, as you can see from the Teapot Tuesday gallery on Splitcoaststampers, most of us went with the cardinal theme. I'd share the inspiration teapot with you, but it has disappeared from the SCS gallery. Not sure what's up with that. MariLynn also wanted us to share something we are thankful for. I'm thankful for many things in my life, especially my friends, including the many cyber friendships I have made through stamping. You won't find kinder, sweeter, giving people than stampers. Stampers have heart; they'll listen to you through good and bad; and they'll make you laugh. 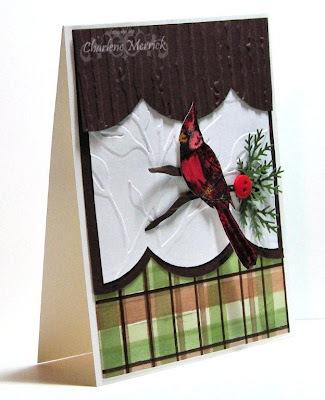 This card is also for Betty's color challenge to use Always Real Chocolate, and for the Doubledog Dare Challenge issued by Anne (Itspassion) to use plaid and a button(s) in our design. I didn't have any plaid designer paper or ribbon in my stash, so I made my own dp with my plaid maker. Hi Charlene your card is GORGEOUS!! Better to play a Tuesday challenge on a Wednesday than a Saturday, but I don't think it really matters as long as you try to show up! This is so pretty and the contrast with the white/red accented by your plaid is gorgeous!! And I agree about the stamping friends...thankful you are one of mine! WOWZA Charlene, it's fantastic hun! Great scallops, embossing, paper, cardinal and sprigs there....I just love the entire thing...very eye-catching! This is sooo pretty, Charlene, with the big scallops and your cardinal is just lovely!!!! Great way to combine the challenges!! !